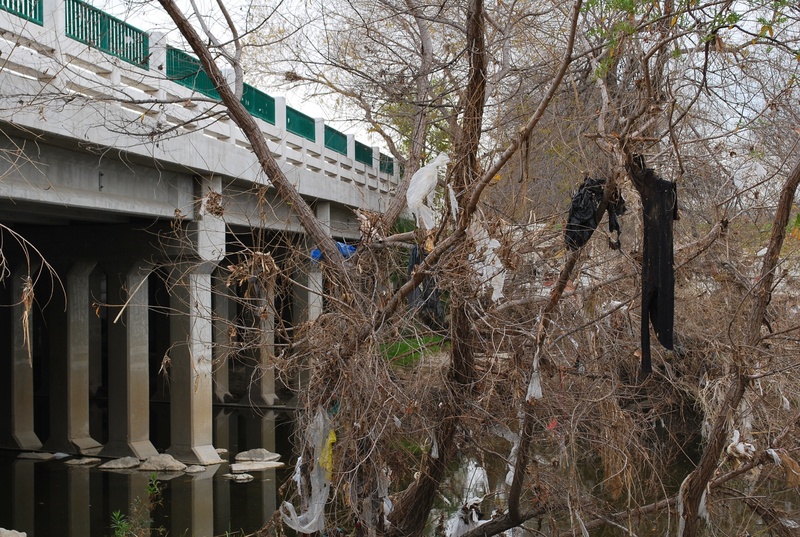 Riding my bike around the Sepulveda Basin today, I was startled and sickened to see a river lined with trash. 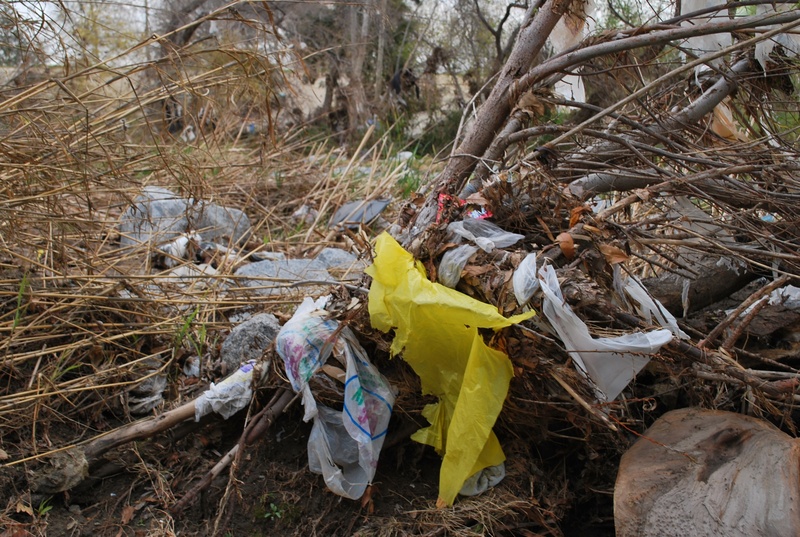 Plastic bags literally covered every branch, every limb, and every single tree along both sides of the banks; devouring, like some gruesome movie monster, nature. The amount of garbage is so extreme, so massive, so overpowering, that the camera’s lens is unable to completely capture the visual tragedy. Like Haiti after its quake, a photographer must decide whether to shoot wide angle, thus diminishing the particular atrocity, or to go close-up, possibly denying the vast destruction all around. I shot these images both far and close to record the appalling filth and criminal neglect of the river. There are other sections of the LA River, formerly encased in concrete, now undergoing naturalization. 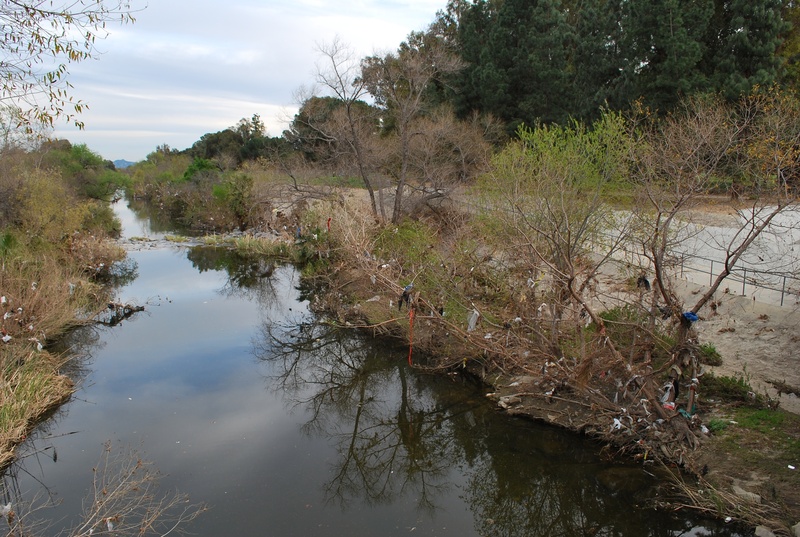 This area of the river, which meanders gently through the San Fernando Valley acts as a flood basin and wildlife preserve. The City of Los Angeles has abrogated its moral and legal responsibility by allowing and ignoring this environmental catastrophe. 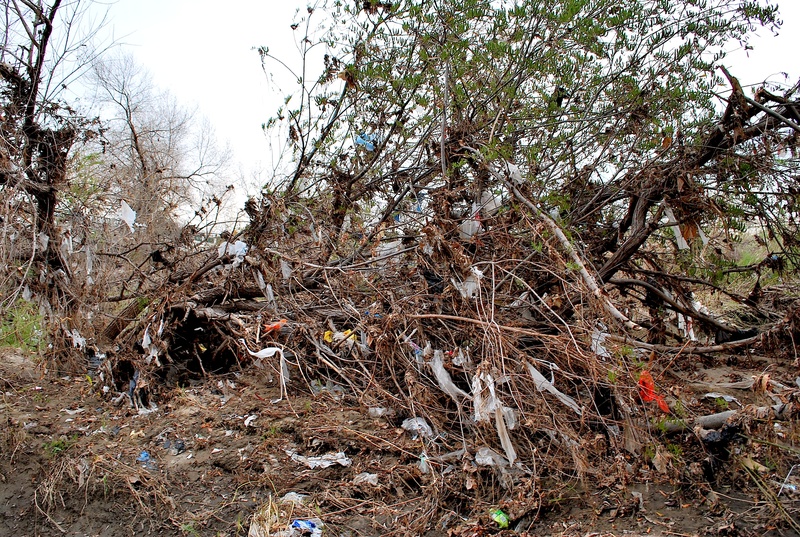 One weekend of box office receipts, from the theaters showing AVATAR in the nation of Moldavia, would probably be enough to pay for a LA River clean-up. Two weeks of Ellen DeGeneres’ paychecks might finance the annual salary of 20 city workers assigned to protect the river. 1/44th of suspected comedian Conan O’Brien’s $44 million dollar pay out might save the lives of thousands of birds. The pictures on this page were shot around Balboa Boulevard in Encino. I moved away from Van Nuys in 2005 and have to say that in all of my 20+ years in the valley, Van Nuys *always* did and still does have a special place in my heart; it’s where I spent my youth. I still love that place and come to this blog every now and again to look at recent images. I come with the hopes of seeing something positive but instead, am faced with the harsh reality at how LA as a whole went from such a progressive and beautiful place in the 80s, to such a craphole now. I recently went down to Irvine on a Grayhound bus to do some work and noticed as we passed through LA how it has changed for the worse. What I see is that LA has certainly and undeniably lost its luster and shine. Unfortunately, the images I see on this blog just confirm my thoughts. At one point, I had just hoped that i was just me and that I was just getting older but that’s not the case at all. These images really do speak volumes. We really, really need to get back to basics and figure out what our real priorities are. This may sound strange coming from me, but LA has not gotten worse, it has improved in many ways. I’ve lived in Los Angeles since 1994, and have seen the city mature. Violent crime is the lowest it has been since 1957. There is a sparkling new subway system that runs from Hollywood to downtown and into East LA and Pasadena. The old areas of LA, such as Echo Park, Downtown, Mt. Washington, Silver Lake and Highland Park are resurgent and full of new young people, stores, artists, restaurants. Air pollution is not as bad. There are biking areas along the San Fernando Valley Busway. Dozens of new architecturally dramatic schools have opened. Culver City is a new destination for restaurants, art galleries and furniture. Farmers markets abound with fresh produce and local fruits and vegetables. North Hollywood, where the Red Line terminates, has many theaters, some new restaurants, buildings, and is an “arts district”. Downtown LA has an Art Walk every month where thousands come to walk inside old buildings and see galleries full of creative works. There is the Staples Center and many new permanent residents living downtown. But Van Nuys, I must say, is not always pretty. Driving down the main arteries of this community is like a vision of a depleted and shopworn suburban hell. Illegal immigration, garbage, mini-mall sprawl, chaotic billboards, fast food, massage parlors, marijuana clinics, psychics…..spread out under a beating, relentless sun and yellow tinted air. There is absolutely no “grand plan” for the civic improvement of Van Nuys. And districts that were formally a part of Van Nuys, continue to secede and form their own fictional towns to cover up the fact that they cannot change the social decline that sickens the Eastern San Fernando Valley. Los Angeles might have once been considered “progressive” but that was 50 years ago when freeways were the path to the future, and college tuition cost $200 a semester. California is the American story writ large, who we are as a nation, what we imagine ourselves to be, and what we actually are. We ought to be proud to be Americans, but completely ashamed at the condition of some of our citizens and cities. I guess that depends which side of the fence you’re standing on. The little metropolis that you’ve describe didn’t just appear out of thin air. There were historic landmarks that told a story of that once great city that were demolished to make way for your little strip malls and starbucks. Personally, I think it is a shame and I am saddened to see such landmarks destroyed to make way for things that have much, much less value; at least to me. LA has one of the highest homeless rates in the entire country. According to HUD, LA boasts 44% of the entire states homelessness. The homeless count stands at a whopping 253,918 in the city and county alone. Violent crime is the lowest it has been since 1957. This is an absolute fallacy, in fact, Los Angeles has more gangs and crime today than ever before. I know first hand because I was a cop. Let me point you to a very short video that I’m sure didn’t get much media attention in the LA area. This is an interview with a now retired LAPD Lieutenant who tells the truth by saying that all of those statistical numbers that are disseminated to the public are finessed and doctored. Heck, listen to the interview yourself and hear it right from the horses mouth. Bear in mind that this man just retired and the data is very recent, also that he worked for the LAPD in a command position and dealt with these numbers directly. It doesn’t get more real than this. But Van Nuys, I must say, is not always pretty. Driving down the main arteries of this community is like a vision of a depleted and shopworn suburban hell. Illegal immigration, garbage, mini-mall sprawl, chaotic billboards, fast food, massage parlors, marijuana clinics, psychics.. spread out under a beating, relentless sun and yellow tinted air. I agree with you. I didn’t like seeing these things either. In my opinion, Van Nuys was the greatest place in the entire valley. It used to thrive with little independently owned shops, some big, some small but non the less, privately owned. Now we all shop at Wal-Mart and Costco and have put mom-and-pop out of business. These things matter Andy and is why we are all suffering as a nation now. Please don’t include me in that; it isn’t something that I’m proud of and if I were you, I’m not sure I would be so quick to boast about that. Again, the homeless rate has skyrocketed, the price of homes and rents is unsustainable, the cost of goods has gone through the roof, having to compensate for these increases and the unemployment rate is higher than it has ever been in LA’s history. Los angeles seems to be coming apart at the seams. There is major corruption going on with the LA County judges accepting money from the County of Los Angeles which of course taints cases heard in court. If your interested in hearing about these issues, you can watch videos about them on the fulldisclosure.net website. Specifically, watch all of the videos having to do with Richard Fine, an attorney that was disbarred and sentenced to “coercive confinement” for attempting to expose this injustice. He has been in jail for a year now with no promise of release. So yeah, if this is your idea of the American story of who we are as a nation and who we imagine ourselves to be, then please don’t count me in. I vote to go back to simpler ways, more interaction with your neighbor, helping people that are down, standing up for your country and saving old landmarks that tell the story of who we were and where we came from. Please don’t get me wrong, Andy… I agree with bettering the city but at what cost and to what end? Someone has to pay for all this progress, no? When a parking ticket for an expired meter costs me $300.00 for being paid late by a day, that is when I say, enough is enough. I reflected on it all on the rest of my run and decided on a plan of action. Remembering my cloth bags when I go to the store, and packing my lunch in washables. Doing whatever I can in my power, to waste less and being accountable for myself. Holding a clean-up party and enrolling those who enjoy playing at the park to help cleaning it up. Not sure what this will take, but my first step is calling up the park. Thank you all for the inspiration! It’s been calling for me. Thank you for your story. It is quite inspirational. My husband’s and son’s scout den have twice visited this area for trash clean up. It is eye-opening. Let me know if you’d like to join us sometime, and i’ll make sure we email you! Yes. I would very much like to participate. OMG we should put together a Balboa clean up gang, it’s such a nice area to walk or jog or bike ride. How about it Andy? I traveled in Albania and FYRM (Macedonia) a few years ago. The resemblance of the riverbanks I found in these broke, former totalitarian states to the LA riverbanks, is very uncanny…and a rather sad reflection. I was actually going to fwd a pic (of the river) to you 2 the other day. 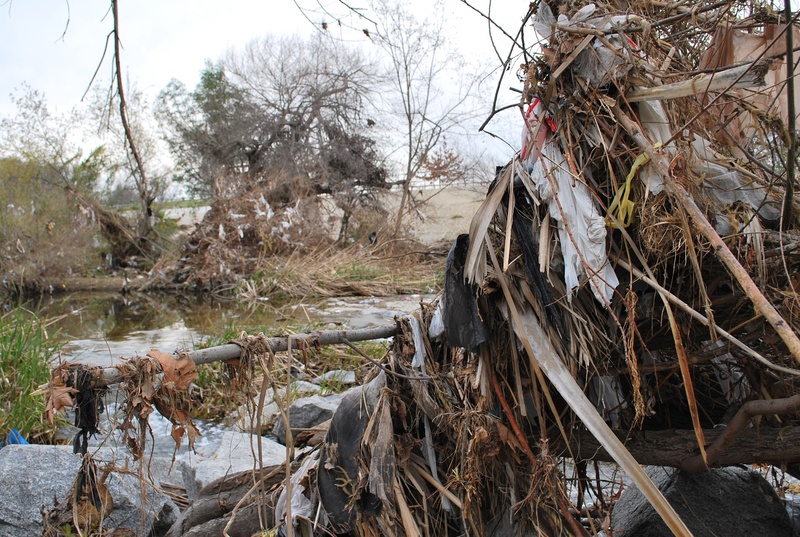 I too excercise @ the Sepulveda Basin regularly & have noticed the ghastly amount of debris. This all seemed to accumulate after last month’s heavy wind & rain storms. Ironically, there seems to be quite a bit of money pouring into some mystery “construction” project just on the other side of of this pic (on Woodley below Victory). This project has been on-going since SEP/OCT of 2009. Los Angeles could easily clean up the river just from the daily revunue generated fr: the city’s parking enforcement citations & towing contracts w/ O.P.G.’s. Your site is a becon, keep up the great work! ← My Home, Your Location.